Next up for Challenge Pears: the main course. We had pizza as our appetizer, so I decided to stick with the Italian theme. And I know cheese pairs well with pears, so how about nestling the fruit inside a soft egg ravioli with Pecorino Romano and mascarpone? Perfect! We followed a simple recipe using flour, eggs, oil, and salt. And with help from our beloved Cuisinart, we created a sticky dough that Nick kneaded until it was smooth, silky, and elastic. While the pasta dough rested, I grated two Bartlett pears and combined the juicy strands with the cheeses and a dash of cinnamon. The resulting filling was sweet (thanks to the pears), salty (thanks to the Pecorino), and buttery (thanks to the mascarpone). Then it was time to assemble our ravioli. Nick rolled and rolled and rolled. But despite all that rolling, the dough was still a bit thick. (Perhaps we need to add one of these to our wish list?) We made it work, though. We used a small round pastry cutter to cut the dough into circles, mounded the pear filling onto one piece, and sealed another on top. 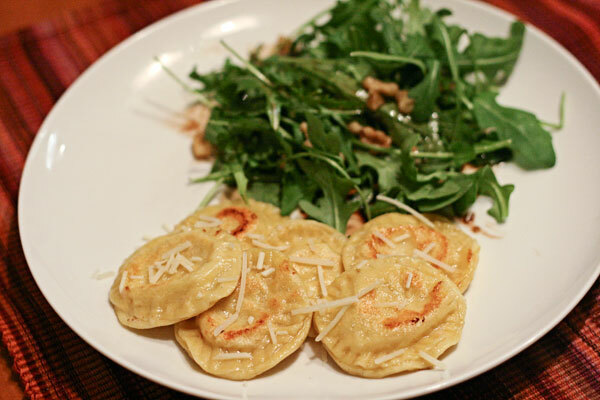 We served our ravioli alongside an arugula salad with walnuts and a quick honey-balsamic vinaigrette. Bon Appetit! Have you made ravioli? Do you have tips to share? Scoop 2 2/3 cups flour into a large food processor fitted with a metal blade. Beat eggs, olive oil, and salt together in a small bowl. With food processor turned on, pour egg mixture into feed tube. 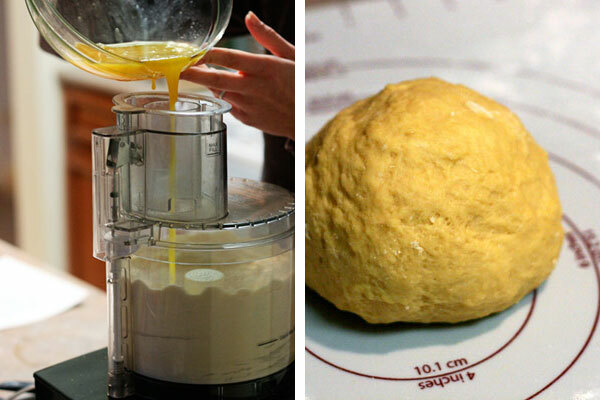 Process until a rough and slightly sticky dough forms. If mixture is too dry, add a very small amount of warm water. 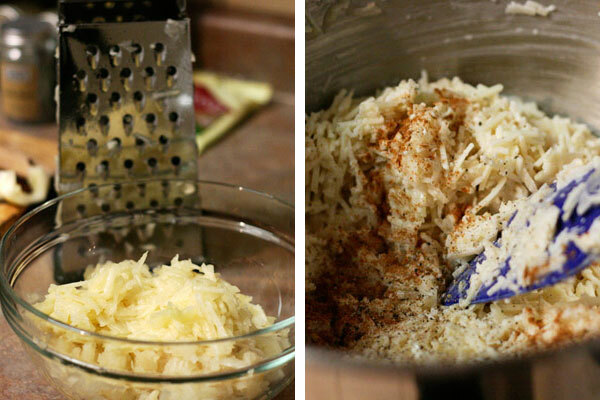 Mix grated pear and grated Pecorino together in a bowl. Add mascarpone. Divide dough into three equal pieces and cover with a clean kitchen towel. Working with one piece at a time, roll dough into a rectangle, about 10×20 inches. Dust work surface lightly with flour as needed; too much flour will make dough difficult to roll. If dough springs back as you roll it, recover with kitchen towel and let rest for 10 to 15 minutes. Repeat with remaining two pieces of dough. Let pasta sheets rest, at least 15 minutes before cutting them. Roll each piece into sheets about 11×30 inches. Keep two of the pasta sheets covered with kitchen towel while you work with one. 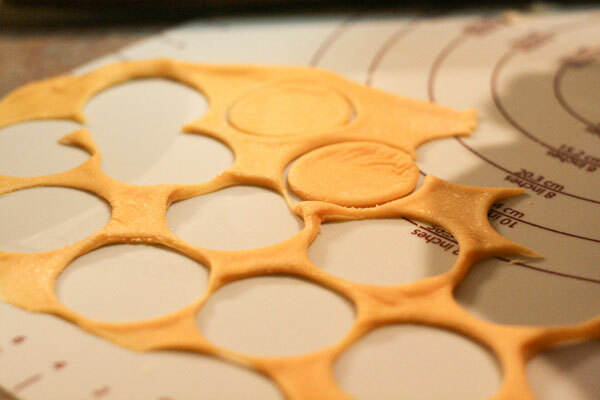 Using a small round pastry cutter, cut dough into circles. Mound pear filling onto one piece and cover with another, stretching slightly and pressing edges together. Then use the tines of a fork to seal the edges. Repeat with remaining dough. Bring a large pot of salted water to a boil. In a sauté pan, melt butter with a cup of water. Cook ravioli in boiling water for 3 to 4 minutes. Drain and then toss ravioli together with melted butter. Remove from heat and finish with Pecorino cheese and coarsely ground peppercorn. 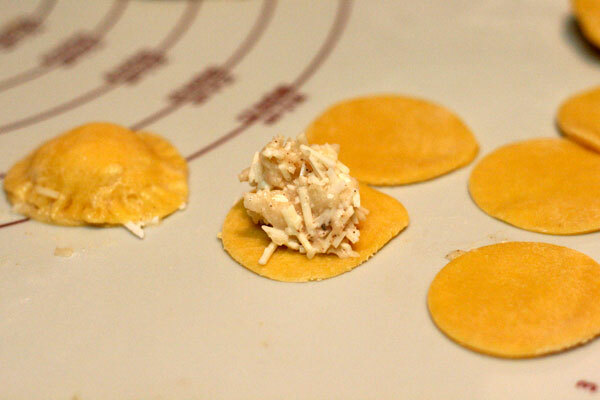 Serve with additional grated cheese as desired. Those Kitchen Aid attachments are fantastic. So worth it. Your ravioli still look incredible. I never thought to stuff pasta with fruit! I am now starving and want the pasta attachment! Made them yesterday, using a dumpling maker to ease the process…though wee do have a noodle maker that does the dough perfectly. They were surprisingly good, and we cooked and froze some for later. Thanks for the idea. Keep up the great work!